Hinshaw, Cecil R., head-of-household, age 28, born in Kansas; father born in Indiana; mother born in Iowa; first married at age 27; rented home ($45.00 rent); radio in home; occupation: superintendent, [..unclear..] mail order dept. ; not a veteran. 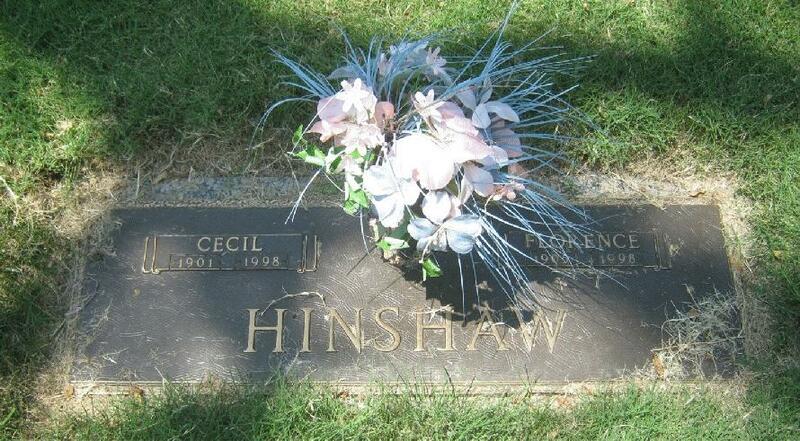 Hinshaw, Florence A., wife, age 24, born in Minnesota; parents born in Minnesota; first married at age 23. Cecil R. Hinshaw, 96, Kansas City, MO, passed away Friday, February 13, 1998, at Baptist Medical Center. Memorial service will be 3 p.m. Monday, February 16, at South Broadland Presbyterian Church; private burial in Mount Moriah Cemetery. Memorial contributions may be made to the church. Mr. Henshaw [sic] was born December 19, 1901, in Emporia, KS. He had been a member of the South Broadland Presbyterian Church since 1942. He played piano for the church's Men's Class for 45 years, and was also a choir member. He retired from Montgomery Ward after 25 years of service. He is survived by his wife of 68 years, Florence L. Hinshaw, of the home; two children, Adelle Newlon, Kearney, MO, and Delbert Hinshaw, Jefferson City, MO; six grandchildren; and seven great-great-grandchildren. (Arr. : Mount Moriah & Freeman Funeral Home). Forence A HINSHAW, 92, Kansas City MO, passed away Thursday, April 30, 1998, at Shalom Geriatric Center. Private graveside services will be monday, May 4, at Mount Moriah Cemetery. Memorial contributions may be made to the Keystone Class at South Broadland Presbyterian Church. Mrs. Hinshaw was born Nov 8, 1905 in Shakopee MN. She lived in Berkeley CA before moving to the Kansas City area in 1941. She was a member of South Braodland Presbyterian Church and had been a faithful member of the Keystone Class and Choir since 1942. She graduated from Whittier College, Whittier CA, with a BA in Education. Obituary of Florence Hinshaw; Kansas City (Missouri) "Star", May 2 1998. Contribution from Galen Lee Hinshaw. Contribution from Lucinda Cunningham Durbin (). 1930 census, Berkeley, Alameda County, California; roll T626-110, ED 288, page 12A, line #30, dwelling #348, family #353. Kansas City (Missouri) "Star", May 2, 1998.